For Western Australians, the garden is part of the living space we call home, and summers are filled with barbecues and happy family dinners. The patio area is the focal point of the garden during those long hot summer days, and is regarded as an extension of the living room, and with an awning for cover, the setting is complete. Today’s awnings are made with composite materials, and a special UV resistant, imported fabric will give you years of service. For those who want the ultimate in comfort, retractable awnings can be closed when not in use, and the awning is concealed behind the cover, and protected from the elements. 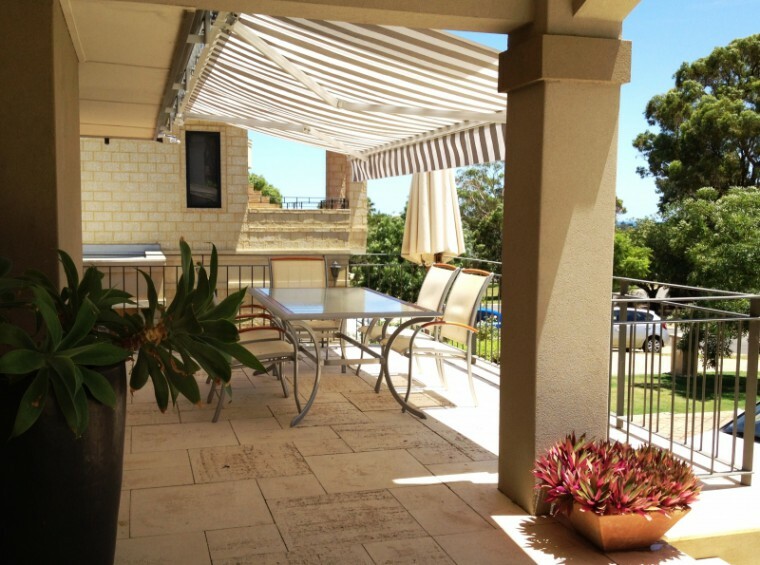 Modern awnings can be opened or closed manually, or with a motor, depending on your preference, and with smooth tracking systems, there are no unsightly ropes and pulleys. Ziptrack® is a revolutionary gliding track system that ensures smooth operation in all conditions, and is the leading system for awning retraction. This new style of window screening is easy to adjust, and as the day progresses, and the sun moves, the awning can easily be adjusted to keep the glare from entering the room. Furniture and carpets don’t come cheap, and the harmful UV rays that penetrate the glass can cause carpets to prematurely fade, and it isn’t a fading of the complete carpet, merely a section, so it looks distinctly out of place. Window awnings also add a touch of character to the property, and with a range of colours and patterns, you will find the right combination that will transform the look of your house. Used in combination with awnings, they can give you a secluded area, and with easy adjustment, your relaxation will not be interrupted by the sun. That sun lounger that was always a nice place to sit early in the morning, before the sun came up, can now be enjoyed at any time. Outdoor blinds have a range of transparency, from total blackout to a clear finish, which gives you a choice between seclusion and visibility. Motorised solutions mean effortless adjustment, perfect for al fresco dining, and with a wide range of styles and colours, there will be something that is ideal for your garden. Modern technology allows for convenience and efficiency, and screening solutions are not only effective, they complement the house too. Introduced to the world by the sunny Mediterranean cultures, al fresco is popular in Western Australia, as the climate is conducive to dining outdoors. Lazy mid-morning brunches and late afternoon drinks will be a much more enjoyable experience when you have total climate control to keep the elements at bay. Attractive on small restaurants and eateries, café and bistro blinds also complement the home, allowing one to relax in comfort, and with stylish pattern and plain designs, they will also complement the property, and no doubt add value to your investment. Awnings and blinds have changed the way we use our garden, and by increasing our living space, they help to bring a better quality of life into the modern home.